The Pop Culture Podcast by Phantastic Geek: Star Trek: Discovery -- 203 "Point of Light"
Star Trek: Discovery -- 203 "Point of Light"
We updated theories on the number of decks on Discovery, based on this Reddit post. We also hit the highlights of Alex Kurtzman speaking at the TCA press tour; all the details were covered by Deadline. Thanks as always to everyone who supports the podcast by visiting Patreon.com/PhantasticGeek. 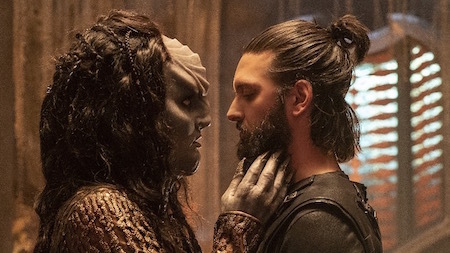 Share your feedback for Star Trek: Discovery by emailing PhantasticGeek@gmail.com, commenting at PhantasticGeek.com, or tweeting @PhantasticGeek. The orange Osnullus on the bridge also appeared in Season One. The blue Osnullus that spoke has previously been seen in Season One near the spore drive and in the mess hall. Also walked into the mess hall in The Runaway. God Friended Me: 114 "The Trouble with the Curve"
Star Trek: Discovery -- 204 "An Obol For Charon"
Punisher: 210 "The Dark Hearts of Men"
Punisher: 208 "My Brother's Keeper"
Punisher: 207 "One Bad Day"